Handy timer is designed to make event timing easier. Perfect of sporting events and workout sessions- grade PT tests to 1/100 second! Shows time of day, month/date and day of the week. You'll find the Pro Survivor useful for just about anything. Water Resistant to 30m.  24 hour timing range. 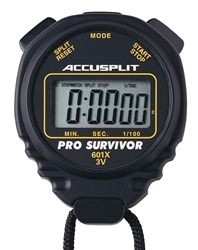  Accuracy is 1/100 second in 40 minutes, and 1 second over 24 hours.  Measures 2-1/2" x 3".